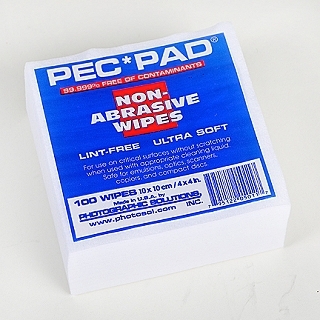 PEC PADs are extremely strong, lint-free and pure (99.999%) that it is almost impossible to scratch an emulsion with them. PEC*PADs are so soft that they can be safely used to clean all types of sensitive surfaces: Scanners, CD’s, mirrors, lenses, telescopes, etc. When PEC PADs are used with PEC-12, they are ideally suited for cleaning photographic film and print emulsions. The 4 x 4 inch (10 cm.sq.) 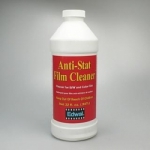 wipes are perfect for cleaning 35mm and other small areas. When properly used with Eclipse, PEC*PADs make it is possible to clean only the dirty portion of lens which eliminates the problem of “hazy swirls”. Simply dispense several drops of ECLIPSE onto a clean, folded PEC PAD and lightly wipe surface in a single direction. Refold pad to expose a clean side and re-wipe, as necessary. Other lens tissues may not work as well.